BMW’s 2 Series convertible has had a mid-life restyle to create a handsome, fuel efficient open top cruiser that combines individual styling with powerful driving dynamics. The longer wheelbase enhances passenger room and the range of engines provides strong performance for any choice of model. 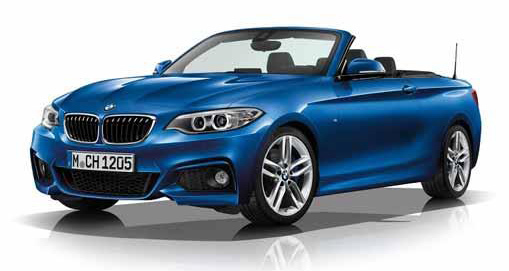 If you are looking for a pleasurable drive, look no further than the 2 Series convertible. A grippy chassis gives great feedback, provides excellent handling and offers a nicely balanced ride. The electric power steering is top of its range and regardless of whether the roof is down or up, wind and tyre noise are well kerbed. On top of a great looking exterior, a bunch of safety features make driving ever more pleasurable. Tyre pressure monitoring incorporates a three-level warning strategy that further enhances the safety of the puncture resistant run flat tyres. 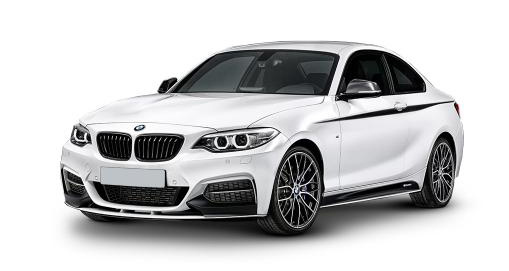 Heated exterior mirrors, windscreen and washer jets ensure great visibility in all weathers further boosted by headlights that are automatically activated by rain sensors. Park Distance Control ensures getting this convertible into the tightest of spaces remains a breeze.